The great English poet William Wordsworth was born just outside the northern rim of the English Lake District, in Cockermouth, Cumberland on 7 April, 1770. His sister Dorothy was born there the following year. William attended Hawkeshead Grammar School, near Windermere – meeting Mary Hutchinson there, his future wife. In 1787 Wordsworth entered St. John’s College in Cambridge University. After he gained a B.A. degree and did some extensive travelling in France, Italy and Switzerland, William and Dorothy rented a house together in Alfoxton House, Somerset in 1797. His friend and fellow-poet Samuel Taylor Coleridge lived nearby in Nether Stowey. In 1798 Wordsworth and Coleridge produced a book of poetry together called Lyrical Ballads. In the 1802 edition of the book, Wordsworth wrote an influential Preface that served as a manifesto for the new kind of poetry that he and his friend were writing. Wordsworth became a seminal figure in English Romantic poetry, a major influence on the younger generation that followed (Keats, Shelley and Byron) – all of whom, surprisingly, he outlived. In the autumn of 1798 William and Dorothy Wordsworth and Coleridge made an extended visit to Germany. When they returned to England, the Wordsworths decided to move back to the Lake District. They moved into Dove Cottage in December, 1799. William married Mary Hutchinson in 1802. They had several children. As the family grew, and the Wordsworth household expanded (Dorothy continued to live with William and Mary; Mary’s sister Sara joined them; and the Wordsworths often had friends and family staying with them for lengthy periods), it became necessary for them to move several times into larger lodgings. But they stayed close to the location of their first home, Dove Cottage. So Wordsworth remained in the Lake District for the rest of his life. He became known as the figure-head of the so-called “Lake poets” – a group of like-minded writers who moved into the area to be near him. On a recent two-week trip to England (primarily to attend a school reunion), I made a pilgrimage to the Lake District on July 12 with my good friend Tony, in order to visit houses and sites associated with William Wordsworth. What follows, in this photo essay, is a photographic record of our visits to Dove Cottage, Allan Bank, Rydal Mount and St. Oswald’s Churchyard - Wordsworth's Lake District Homes. Dove Cottage is in the village of Grasmere, about four miles north-west of Ambleside, which is itself about the same distance north-west of Windermere. William first saw the house on a walking tour of the Lake District with Coleridge in 1799. When he and Dorothy wanted to establish a permanent home in the Lakes, he remembered the place. Dove Cottage had been empty for a while. They moved in on December 20, 1799 – paying £5 per year in rent to John Benson of Grasmere. Dove Cottage, like most houses of its vintage is built of local stone. The external walls are coated with a limewash. And the roof tiles are made of slate. It was built in the early 1600s. Unfortunately (for me), photography is not allowed inside Dove Cottage. So I could only capture images of the outside. But I did find a few pictures of the inside posted to the internet. 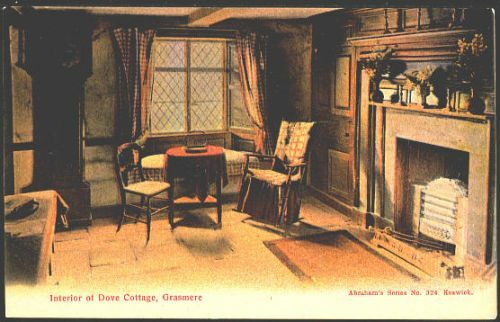 The picture above is from a 1907 postcard which shows the main reception room. It’s the first room you see upon entering the house. It was called the “houseplace” or “kitchen-parlour”. It was used for the main daily meal. This woud have been one of the main drinking rooms when the building was used as a pub. It retains the oak panels and slate floors that are typical of well-built Lakeland houses of the period. 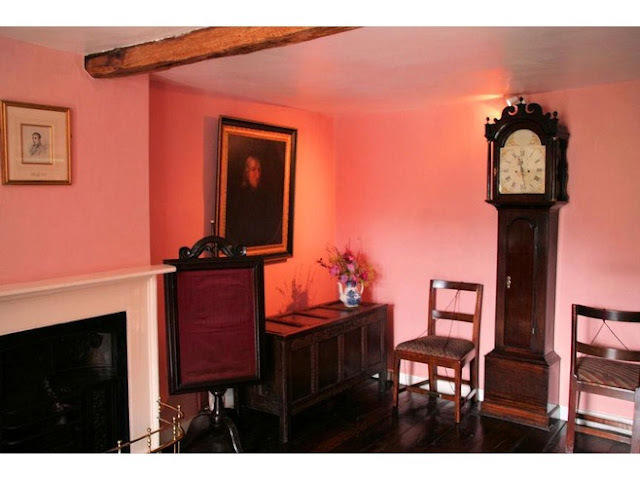 The photograph above (not mine, since photography inside Dove Cottage is not permitted) shows the room on the upper floor (above the “houseplace”) which Wordsworth used as his study. It was also used as a second parlour for light meals and entertaining. In the Wordsworths’ time there were no buildings on the opposite side of the lane, so they enjoyed an uninterrupted view from the window in this room over the meadows to Grasmere Water. The other three rooms on the upper floor were used as bedrooms. The smallest bedroom (above the "buttery") became the nursery for William amd Mary's children. Without a fireplace, the room was cold in the winter; so Dorothy covered the nursery walls with varnished newspapers in 1800 as an attempt to insulate the room. This newspaper wall-covering was later removed, but the museum added copies of those nineteenth-century papers in the 1970s. The photo above (again, not one of mine) shows a bedroom at the back of the cottage on the upper floor. It was used as the guest bedroom. The window provides a good view of the garden. The Wordsworths' many guests would have slept in this room, including Walter Scott, Samuel Taylor Coleridge, Charles and Mary Lamb, Robert Southey, and Thomas De Quincey. When not being used as a bedroom, it was often used for storage. Dorothy refers to it in her Journal as “a sort of lumber room”. 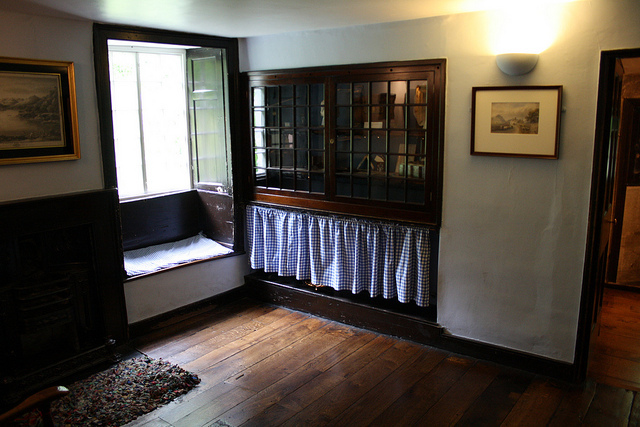 There was no running water inside Dove Cottage during Wordsworth’s residence there. And the toilet was in a small outhouse. William and Dorothy took a special joy in the garden and orchard they established behind the house: “the work of our own hands”, Wordsworth proudly wrote. They arranged it in an informal “wild” state. Later, of course, this became the familiar style of the English country-cottage garden. They called it their “little nook of mountain-ground”. During his time here at Dove Cottage, Wordsworth wrote much of his most famous poetry: “Ode: Intimations of Immortality”, “Ode to Duty”, “My Heart Leaps Up”, “I Wandered Lonely as a Cloud” and some parts of his epic autobiographical poem The Prelude. His sister Dorothy kept a fascinating journal during their long residence in this house. It was eventually published in 1897 as The Grasmere Journal. It showed that William must have read it on a regular basis, or Dorothy might have often read it aloud to him. He clearly borrowed ideas and sentiments from her Journal: an entry in 1802, for example, describes a glorious field of daffodils they came across near Ullswater. Almost two years later, William composed his famous daffodil poem: “I Wandered Lonely as a Cloud”. William and Mary’s first three children were born in Dove Cottage within four years. Eventually the place became too small to hold the growing family and its permanent guests. So they moved to Allan Bank in May 1808. Wordsworth’s literary friend Thomas De Quincey (author of Confessions of an English Opium Eater - 1822) moved into Dove Cottage and lived there from 1809-1820. The house was eventually acquired by the Wordsworth Trust for £650 in 1890. The following year it was opened to the public. It now receives about 70,000 visitors each year. The Wordsworth Museum was opened next-door in 1943 and then moved to a nearby coach-house in 1981. Finally, a new building was opened in 2005, called the Jerwood Centre – it houses the large collection of Wordsworth memorabilia collected over the years by the Wordsworth Trust. For details about admission prices, opening hours throughout the year, and directions to Dove Cottage, visit the Wordsworth Trust's Dove Cottage website. The Wordsworth family moved into Allan Bank in May, 1808. It was an ironic move, because Wordsworth had condemned the house as an “eyesore” when it was first built. Allan Bank is a large Georgian villa built by a Liverpudlian attorney called John Gregory Crump between 1805 and 1806. The house has a prominent position overlooking Easedale Valley, near the southern face of Helm Crag. Wordsworth didn’t like the fact that Crump was a newcomer to the Lake District; and he was building a large mansion that obstructed his view north from Dove Cottage – “belching” smoke from its poorly constructed chimneys. He called it a “temple of abomination”. Wordsworth’s reference to Allan Bank “belching” smoke proved prophetic. When he, Mary, Dorothy, and the rest of the Wordsworth tribe were ensconced in their new home, they suffered endless problems with smoking chimneys during their first winter in the place. Smoke often filled rooms in the house and, because of a persistent down-draught, also hung about the garden and grounds. On top of that, the house had incurably damp walls. Changes have been made to the house over the years. The Wordsworths had a beautiful bow window added to the front of the house in 1809. When Thomas Dawson bought the house in 1834 for £4,100, he significantly extended and altered it. Not only did he remodel the main house; he also built a lodge nearby on the Easedale Road. The major problems the Wordsworths encountered with Allan Bank – the fireplaces, the damp walls, and the falling-out they’d had with their landlord – pushed them into abandoning the place in 1813 and setting up home for a while at The Rectory in Grasmere. They had been in Allan Bank for a couple of years and William and Mary had two more children. Samuel Taylor Coleridge and Thomas De Quincey had spent long periods living with them. After Wordsworth left Allan Bank, it went through other ownership before being bought by Canon Hardwicke Rawnsley in 1915. This interesting man was a clergyman. 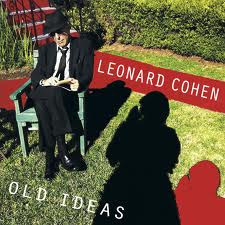 He was also a literary man: he wrote many hymns and was constantly writing sonnets. He wrote them as poetry; he also wrote letters to the newspapers in the form of sonnets. In the course of his life he wrote 30,000 sonnets! Obsessed, or what? Rawnsley also helped form the association that became known as The National Trust. After he moved into the house in 1917, he became active locally in defending properties from inappropriate development. He became incensed when the island in the centre of Grasmere Water was sold to an individual who then restricted access to the public. At his death in 1920, Rawnsley bequeathed Allan Bank to The National Trust. Allan Bank has been owned by The National Trust for many years, but has also been rented out regularly to residents. There have been two serious fires in the house - one in the fifties, and the other quite recently, back in March of last year. This recent fire was thought to be caused by electrical failure. The National Trust took back control of the house. Major restoration was done to ceilings and walls. But a lot of comprehensive decorative work has been delayed whilst the Trust decides on what the house will be used for. In the early stages after the fire, school groups, special visitors, and the general public have been given access into the house and encouraged to suggest different roles that the house might play. Various rooms have been set aside for different themes – reading, art work, history, etc. So Allan Bank is now a work in progress. It will be interesting to see what evolves there. To read details about the current situation at the house and what is being considered for the future, visit The National Trust’s Allan Bank web page. There is also an Allan Bank Facebook page that you van visit. The Wordsworth family moved into Rydal Mount in 1813. The house is located half way between Grasmere and Ambleside, just off the A 591 and close to Rydal Water. Wordsworth rented his new home from Lady Le Fleming of nearby Rydal Hall for 46 years – until his wife’s death in 1859 (William died in 1850). In Rydal Mount, the Wordsworths had a large house that could hold the extended tribe of family and friends that now clustered around the famous poet. True, it wasn’t as big as Allan Bank, but that made it cosier and warmer. And in their current conditions, the lived-in atmosphere of this more modest house is a really attractive sight after the run-down, hollowed-out condition of the fire-damaged mansion at Allan Bank. One of the quirky facts about the three Wordsworth homes that I am featuring here is that they are all controlled by different organisations: Dove Cottage is operated by the Wordsworth Trust (established in 1890 specifically to preserve the cottage); Allan Bank is run by The National Trust; and Rydal Mount is owned and operated as a tourist site by descendants of the Wordsworth family. Mary Henderson (neé Wordsworth) re-acquired Rydal Mount for the family in 1969. She is William Wordsworth’s great, great granddaughter. The house was opened to the public in 1970. Rydal Mount is a house built in different periods. The dining room is part of the old Tudor cottage, with the original flagstone floors and oak beams. The impressive drawing room and library were added in 1750. They are now decorated in a comfy 60s/70s style, with lots of contemporary Wordsworth family photographs. William Wordsworth was a keen landscape gardener. Soon after moving in, he set about designing the four acres of grounds which surround the house. The gardens today remain pretty much as he set them up back in the early eighteenth century. In season, the garden’s various blooms – bluebells, daffodils, rhododendrons – produce a spectacular display of colour. Wordsworth often said that the gardens of Rydal Mount were his real office, not the office/study he set up in the attic of the house. In fact, he eventually built a small “writing hut” in a secluded spot of the garden, with just a bench and roof to keep away the rain. 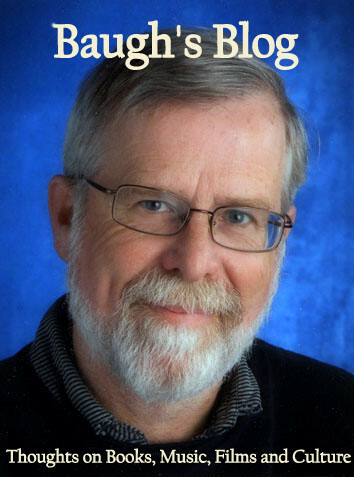 He did most of his serious writing there. ﻿Close to Rydal Mount - on the lane leading up to the house – sits St. Mary’s Church. Beside the churchyard is a substantial field - the Rash field - which Wordsworth bought with the intention of building a house there for his daughter Dora. The project was never completed. When Dora died in 1847, William, Mary, Dorothy and the gardener planted hundreds of daffodils as a memorial on that land. This plot became known as Dora’s Field, and it now belongs to The National Trust. In the spring the area is completely covered with daffodil blooms. You can't help thinking of William's famous daffodil poem inspired by Dorothy's journal entry in 1802. To see a full-screen version of this image, click on this link. 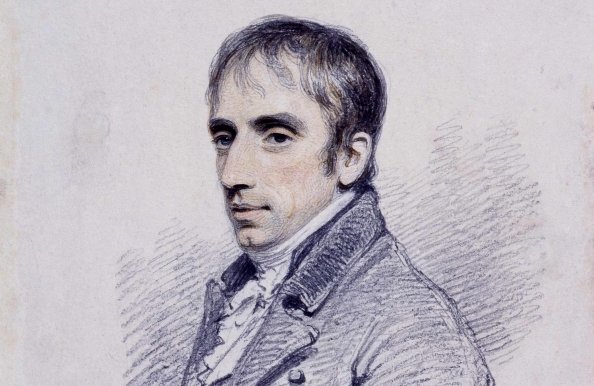 William Wordsworth caught a bad cold during a walk in the country, re-aggravating a case of pleurisy he had recently suffered. He died on April 23 – St. George’s Day – in 1850, aged 80. He was buried in the village of Grasmere, near Dove Cottage, in St. Oswald’s Church. St. Oswald, a seventh-century Christian king in Northumberland is said to have preached on the site of the church. This is the parish church for Grasmere, Rydal and Langdale. Inside St. Oswald’s Church, the thirteenth-century nave contains several memorials to the Le Fleming family – it was Lady Le Fleming who had originally rented Rydal Mount to Wordsworth back in 1813. But most visitors inside the church gravitate to the two Wordsworth memorials. There is a glass case set up next to the organ which contains Wordsworth’s own prayer book. And on the wall of the nave shown to the left is a formal memorial of William Wordsworth carved in marble. Wordsworth himself planted eight of the yew trees growing in St. Oswald’s churchyard. One of them sits beside the grave of William and his wife Mary. Nearby lie the graves of many other family members – including those of his sister Dorothy, his children Dora, William, Thomas and Catherine, and Sara Hutchinson, Mary’s sister. Here’s my friend Tony Grant sitting behind St. Oswald’s Church. Just behind the stone wall are the Wordsworth family graves. In front of Tony are individual little paving stones with the names carved of those who have donated money for the upkeep of the Wordsworth park and memorials here. Tony accompanied me throughout this long day of pilgrimage to the homes of William Wordsworth in the area of Grasmere and Ambleside. He did all the driving, too. Thanks, Tony! No wonder Tony looks knackered! We had a great couple of days in The Lakes before driving south to Liverpool. I thoroughly enjoyed our trip together. Michael, a few beers later and all was well.. Thank you so much for the wonderful Wordsworth tribute, information, and photos! Indeed, the Lake District seems to be a gorgeous area.